We recently called Hard West "one of the games we were looking forward to most" ahead of this year's PAX Prime. It follows the adventures of a hard man named Warren, who "will walk a treacherous path of chaos and revenge to punish those who wronged him." It sounds like pretty much every Western ever, except that this particular spin also happens to be enshrouded by the supernatural. 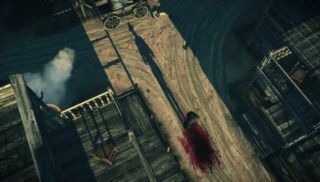 Hard West is a turn-based tactical combat game featuring "an eclectic collection of firearms including outlandish prototypes of the era," as well as all sorts of special powers appropriate to a world crawling with demons and monsters. The story will unfold across eight "story-based scenarios" and 40 unique missions, with events and the fates of the game's "colorful characters" changing based upon the decisions you make during and between scenarios. Publisher Gambitious announced today that Hard West is set to come out on November 4. If it sounds like your kind of thing, it's available for preorder at a 20 percent discount off the regular $20/£15 price on Steam. Catch our video preview of Hard West from PAX Prime 2015 right here. We'll have a review around release.